We hope this update finds you and your family overflowing with enthusiasm after another inspirational year. Despite the clamor of political debates throughout the world, let us work with renewed determination to expand our communities and come together under Krishna’s tranquil shelter. Although well into the new year, it is befitting to review last year’s accomplishments with regards H.D. Goswami’s numerous projects, programs, and activities. In addition, we will recognize the invaluable service rendered by our godfamily throughout 2016. Perhaps the biggest news of 2016 was the expansion of Krishna West. Thanks to H.D. 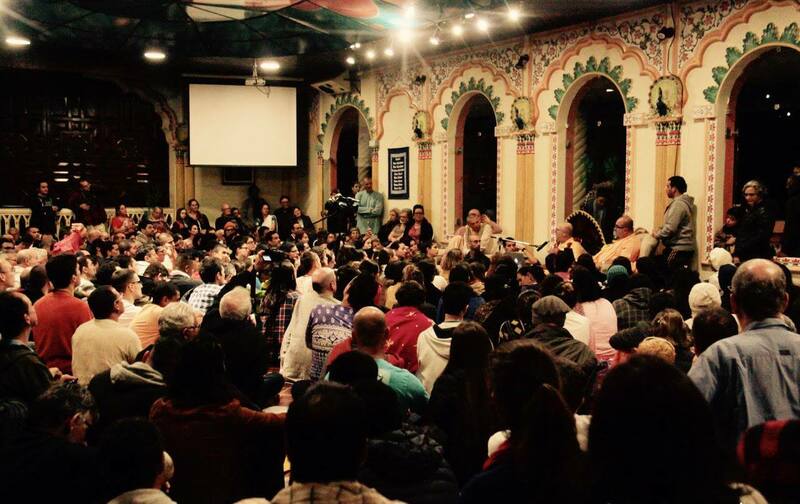 Goswami’s tireless work and the pioneering efforts of those eager to restore Srila Prabhupada’s Western mission, new Krishna West communities are forming in Austin, Dallas, Houston, New York City, Tijuana, and Panama City. Moreover, previously established projects are continuing to develop. For example, KW Chapel Hill is attracting brilliant minds, many of whom are graduate students in the Raleigh-Durham-Chapel Hill region. H.D. Goswami remarked that during his visit last fall, he was actually shocked by the turnout of students and the philosophical rigor of their questions. KW London has expanded its program and now offers weekly presentations at the University of London. KW Orlando has also experienced steady growth and is offering classes twice a month at the request of their eager participants. Read more project updates HERE. Last year’s biggest headlines included H.D. Goswami and the GBC reaching a fair agreement with regards Krishna West. The announcement was made several months after meetings in Los Angeles between H.D. Goswami, the GBC chairman Praghosha Prabhu, and Vaisesika Prabhu. H.D. Goswami is hopeful that his relationship with the GBC will continue to improve. While encouraging and advising devotees who are pioneering Krishna West projects as well as finishing up a 4-month lecture tour of the USA, H.D. Goswami continues to concentrate on his various writing projects. Now in the final stages of layout, H.D. 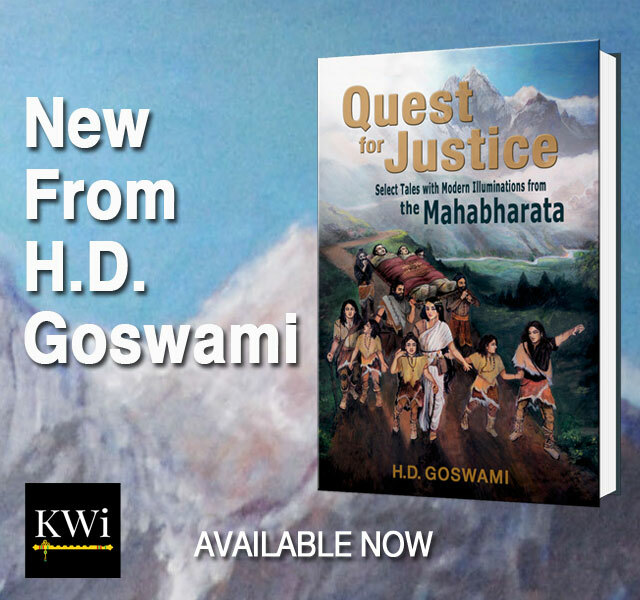 Goswami’s newest book is due to hit bookshelves this spring! Although the book was intended to be published in December 2016, the release has been delayed to increase pre-release sales and meet our minimum printing threshold. If you would like more information about H.D. Goswami’s upcoming book and pre-release purchasing options, please sign-up HERE. Since H.D. Goswami’s A Comprehensive Guide to Bhagavad-gita was published, the book has been translated and published in Portuguese, Italian, and Spanish. Two additional translations, French and German, will be published later this year. This past December, over 450 books were distributed throughout libraries and universities in Mexico. Several cases of A Comprehensive Guide to Bhagavad-gita were also recently purchased by an American university to be used as textbooks. Please help us continue to increase online book sales and ranking by submitting a book review on Amazon.com. In 2016, H.D. Goswami published two significant essays. The first essay, Sariology, is a critique of an essay in which a senior Prabhupada disciple attempts to substantiate why Krishna conscious women should wear an Indian dress known as the sari. H.D. Goswami demonstrates that the author gives false reasoning. 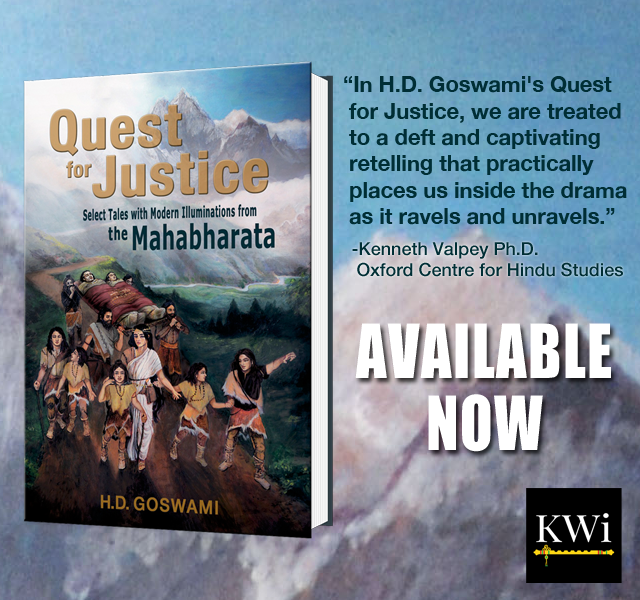 The second essay, ISKCON’s GBC, offers a penetrating analysis of ISKCON’s leadership and justice system. He argues that a failure to follow the GBC system will sabotage Prabhupada’s ISKCON, but an unjust or oppressive GBC will itself destabilize and undermine Prabhupada’s GBC system. We would now like to recognize the various individuals who have collectively volunteered tens of thousands of hours of service this year maintaining H.D. Goswami’s online media and correspondence platforms. First, let us give special recognition to Ananda Lila dd, who lovingly manages H.D. Goswami’s Facebook page, Instagram, YouTube, and event calendar, all the while maintaining Krishnawestinc.com and processing H.D. Goswami’s book sales! Thank you to Jaya Sita dd for her invaluable service as H.D. Goswami’s email secretary, Giridhari das for managing H.D. Goswami’s Yahoo “Istagosthi” email listserv, Dharma das for maintaining H.D. Goswami’s lecture database, and Greg Krier for managing Krishnawestinc.com. We are also grateful to Danesha das and Dhananjaya das, who manage H.D. Goswami’s Facebook group for friends and disciples in English, and to Shri Rupa Manjari dd, who manages a Facebook group for friends and disciples in Portuguese. Moreover, we are indebted to H.D. Goswami’s dedicated translators: Madhaviya dd (Portuguese), Kadamba dd (Portuguese), Pralambaha das (Polish), and Yamuna-pavani dd (Spanish). We would also like to acknowledge H.D. Goswami’s publishing team, headed by H.D. Goswami’s talented godbrother and senior editor, Aja das. Special recognition goes to his assistant editors, Sara Crow, Duhsala dd, and Chandrabhanu das, in addition to his transcription team—Frederick Grave, Prema Manjari dd, and Abhishek Tandel. Thank you to Revati Prema dd for copy editing and Danesha das for his meticulous design and formatting service. We are also grateful to Devala Rsi das, Gargamuni das, Chandrashekhar Acharya das, and Mahattama dd for their help with USA book distribution, not to mention all of the devotees involved with the translation, publication, and distribution of H.D. Goswami’s books throughout the world. Last but not least, a sincere thank you to H.D. Goswami’s Vyasa Puja team—Madhaviya dd, Shanti Day, Emily Dietzel, Sri Govinda das, and Lilananda dd—for organizing this year’s submission process. We are also extremely appreciative of Janatari dd, who designed this year’s Vyasa Puja e-book. Thank you all for your steady service. Of course there are many more individuals who deserve to be recognized, namely those who are pioneering Krishna West projects throughout the world. We are all rooting for your success! As you can see, H.D. 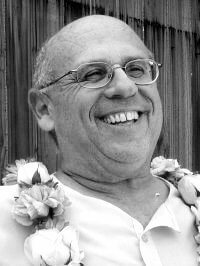 Goswami heavily depends on the commitment of countless volunteers to support his service to Srila Prabhupada. And we, in turn, heavily depend on the generosity of countless patrons to support our service to H.D. 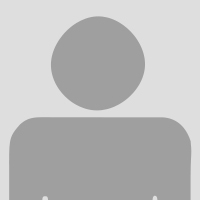 Goswami. We would like to recognize the generosity of the following devotees for their financial contributions in 2016. Donations to H.D. Goswami’s Online Media Fund allow us to consistently maintain and develop both HDGoswami.com and Krishnawest.com, in addition to the various social media platforms we utilize to expand his outreach. Thus, we are asking for contributions of any size to assist us in achieving these goals and maximizing H.D. Goswami’s online presence and accessibility. Your donation will ensure that his teachings, insights, classes, and publications are accessible and effectively broadcasted throughout the world. Please click HERE to make your contribution. You can also help improve H.D. Goswami’s media by taking several minutes to carefully fill out the survey below. 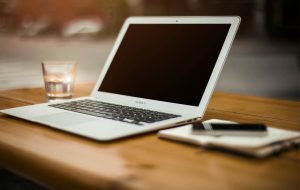 We are particularly interested in receiving input with regards downloading H.D. Goswami’s classes. Furthermore, HDGoswami.com is currently looking for several sound technicians, video editors, and experienced website managers to join our media team. If you are interested in getting involved, please fill out the skills section at the end of the survey. Altogether, we hope to have adequately conveyed the highlights of H.D. Goswami’s productive and prolific 2016. Aided and assisted by loving disciples and well-wishers, H.D. Goswami is extremely grateful for everyone’s service. Please pray that under his shelter, we may continue to deepen our sadhana, improve our service, expand our outreach, and experience the profound joy of Krishna consciousness more and more every year. Thank you all and Hare Krishna!